and the winner is: BILL CUNNINGHAM !! both documentaries – ‘BILL CUNNINGHAM NEW YORK’ (2010) and ‘L’AMOUR FOU’ (2010) – are now out on NETFLIX INSTANTS. both of these fashion-world documentaries played to small audiences, when they were premiered – but maybe it’s time to check them out on the home screen – via Netflix. one is the story of (growing) local NYC legend, the New York Times fashion photographer BILL CUNNINGHAM, still going strong at 83 !! the other is the story of the fashion giant, YVES ST LAURENT who died in 2008 at the age of 72.
apart from the fact that the New York City film – is the better watch, the edit is better – sharper. the films are a study in contrasts. here you have BILL CUNNINGHAM a true fashion paparazzi – with a long trajectory to some sort of fame – for himself – as opposed to his famous subjects. with very little in the way of material goods, just him, his endless files of 35 mm photos, and his bike. which he still rides with great gusto and vibrancy through the streets of New York – in search of the newest trends and it-girls !! and YVES ST. LAURENT who despite, or maybe because of an early rocket-ship career, with the resultant overabundance of material wealth and acclaim, a period of overabundant and out-of-control hard partying that he had had to put behind him, and enough possessions, homes, and artwork to initiate a serious auction – was tormented, depressed, burnt-out – and dead by 72. Bill Cunningham is portrayed as the archetypal loner. 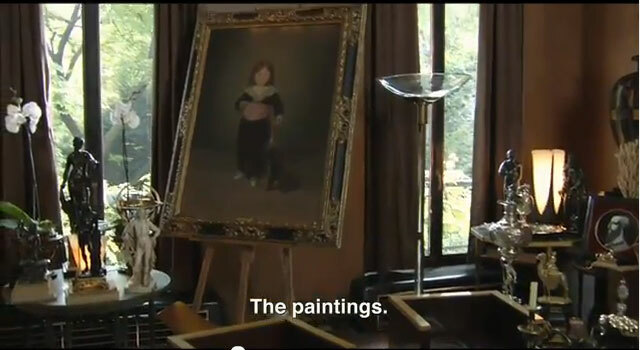 Yves is remembered throughout this film by his long time lover and business partner, of over 50 years, PIERRE BERGE – who in fact narrates this film – and sets its sad tone and depressive talking points. BILL CUNNINGHAM, today. or rather at 81 in 2010. and yeah he’s still out there, on his bike !! with his (film) camera around his neck – as vibrant and sharp as ever . . . maybe it’s that bike that keeps him so fit !! his critical eye, honed on the streets for decades – is renown for a top-notch trend-catching take – that still can’t be beat. and maybe that’s also what keeps him so driven, and sprightly. chasing the talent and the scene. tell me about it !! you couldn’t say anything better bout an on-the-scene 24/7 photo street stalker !! in the film Bill says, cutting edge fashion is just out there for the taking, on the street – all the time. it’s just a matter of being able to catch the moment. and the clues, it’s called: radar. it’s also interesting to note that he had hands-on skills. He worked as a ladies’ hat maker – in fact he was a very stylish and accomplished milliner in the 50s – when he was in his 20’s in NYC. according to BILL CUNNINGHAM/WIKIPEDIA, his photographic career in the New York Times took off – when quite by accident he took some photos of a woman on the street in a coat that had caught his attention, despite it being “quite plain”. the woman ? GRETA GARBO !! . . . and “as a result of a chance photograph of Greta Garbo – he published a group of his impromptu pictures in the New York Times in December of 1978” . . . that would have made him: 50 !! late bloomer or what . . . if he’d been born any later – he’d probably have to settle for being a blogger. but maybe not, he made some interesting and very fiercely intelligent connections early on, and – well, you’ll just have to watch the film – for the lowdown on that !! DETAILS and WOMEN’S WEAR DAILY, included. there’s also another golden info nugget in that WIKIPEDIA article, that goes . . . as a result of that chance photo of Greta Garbo, with which he began his long series of “impromptu photos” – that still run in the Times, ‘On The Street’, and his high society party column, ‘Evening Hours’, both in the Saturday Style section – Arthur Gelb, his editor has called these ‘impromptu’ photos . . . “a turning point for the Times because it was the first time (!!) the paper had run pictures of well-known people without their permission”. 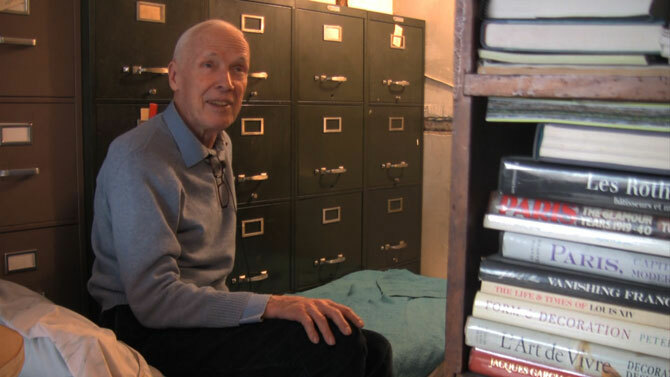 so Bill lives very simply, and happily – alone – with only a cot to sleep on set up among his treasured photo-filled filing cabinets. and p.s. no hard drives for him !! hard copy, only. it’s fun to watch him work on the negatives, processed in a local neighborhood store, no less. and later on, banter with his ‘digital’ newspaper assistant – as they do the final lay-out. one of the most fun subtexts of the film . . is people trying to determine if he shares a wealthy background with his more famous subjects – as he gets along so easily with them, NOT !! but another entertaining nugget is when the film watches as he cautions some major mogul – at what appears to be a big museum function: “careful, one handshake could mean a new wing.” !! 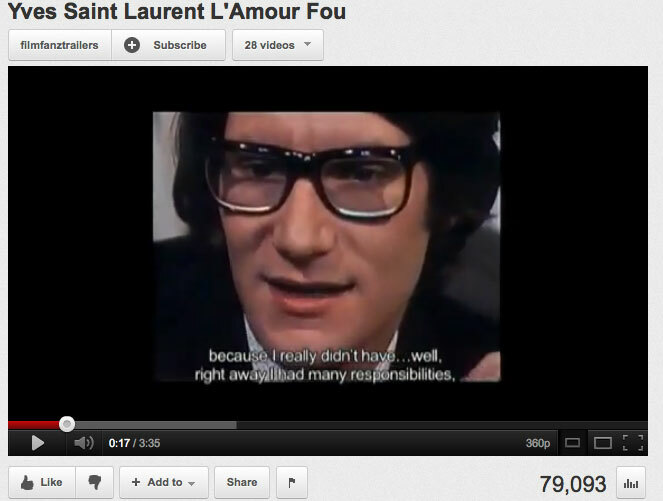 a young kickstart genius by anybody’s standards – YVES SAINT LAURENT – was truly a rocket scientist. look at that face. he could be walking around Williamsburg, if not national reality TV shows, today. though the math seems unbelievable, he was only 17 !! when in 1953 he won a major Paris fashion competition, and not too much afterwards – – he was heading the house of Dior !! the archival clips of him in the film – are astounding for his sensitivity and intelligence. and shyness. later on he personally attributes his great debilitating depression to the fact that he came to power so soon, and missed out on some freedoms, along the way. though of course there are pix of his ground-breaking chic chic fashions, as well as archival clips and contemporary interviews with his muses !! – this is not a ‘VALENTINO, THE LAST EMPEROR’, and too bad. but it is something else, and maybe that’s ok, too. it’s a love poem of a very sad nature from his long time partner PIERRE BERGER, who is in fact telling the story. it’s a bit of a sad story . . . despite all the fame and glory, and houses and possessions. maybe there’s a moral in there, I don’t know. maybe they should have taken up – bike riding !! cause you sure can’t take it with you !! and it’s a lot of work – to unload !! and funnily enough – nothing really caught my eye – as super great art, even as the decorative arts go. but hey, about that house in Morocco – !! 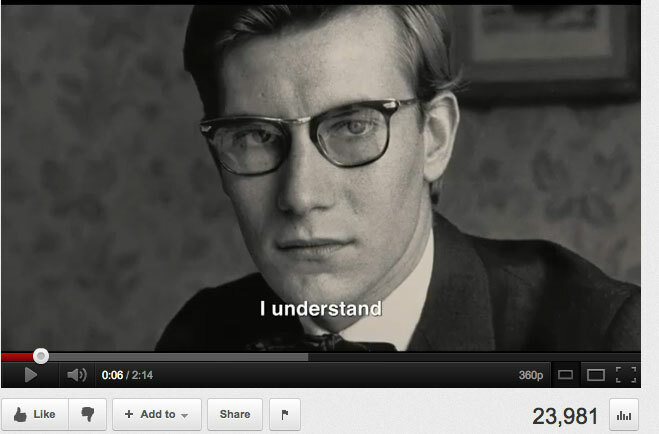 the young and radiant YVES SAINT LAURENT. . . burnt out by his 70s. but by some standards (McQueen) that was a good long ride. they don’t seem to have a film website – but you can catch two trailers, here’s the first . . . YVES ST LAURENT – ‘L’AMOUR FOU’. and here’s: the second . . . YVES ST. LAURENT – ‘L’AMOUR FOU’. ALL PHOTOS – FROM THE OFFICIAL FILM WEBSITE (CUNNINGHAM) and YouTube (ST. LAURENT).